Motorcycle / Small Wheel Mount/Demount Iron Ken Tool T43A / BOWES KT T43A. New designs are based on popular European styles. 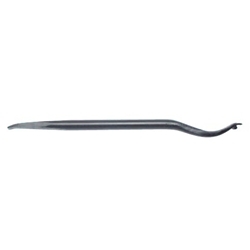 Extended length of the flat curved sliding surface provides mounting ability comparable to much longer traditional tire irons. Sizes available for motorcycle, passenger, truck, and heavy-duty tires. Designed for mounting and demounting tires. Best if used in pairs.